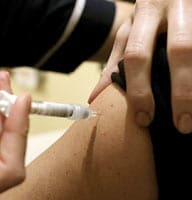 Authorities claim that the alleged victims received Â£1-2 to be tested with what they thought was a conventional flu vaccine but, according to investigators, was actually an anti bird-flu drug. Although authorities have yet to prove a direct link between the deaths and the activities of the medical staff, Poland's health minister, Ewa Kopacz, has said that the doctors and nurses involved should not return to their profession. "It is in the interests of all doctors that those who are responsible for this are punished," the minister added.